New Delhi : A report by military expenditure monitors Stockholm International Peace Research Institute (SIPRI) has found that India was the fifth largest military spender in 2016. India’s military expenditure for 2016-17 was $55.9 billion. For 2017-18, the Union Budget allocated a defence budget of Rs. 3,59,854.12 crore (US$ 53.5 billion) to the Ministry of Defence (MoD). 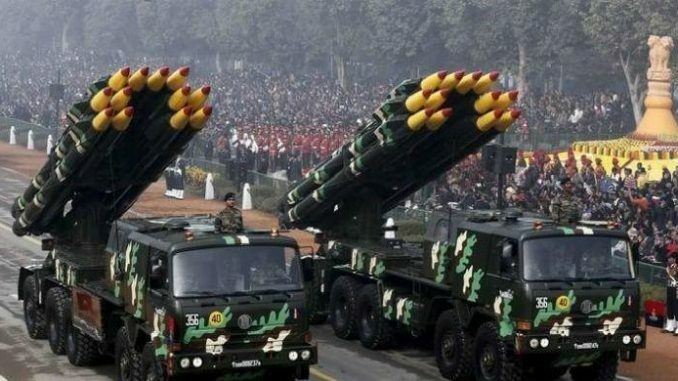 Union Minister for Finance Arun Jaitley said in his budget speech “for Defence expenditure excluding pensions, I have provided a sum of ₹2,74,114 crore including ₹86,488 crores for Defence capital.” The defence budget was an increase of 5.3 per cent from the previous year. Its share in the GDP was estimated to be 2.14 per cent and it forms 16.76 per cent share in the Central government expenditure. The revenue expenditure estimated was ₹1,75,861 crore and capital expenditure of 86,528.7 crore. On the global stage, the SIPRI report finds that US, China, Russia and Saudi Arabia took the top four positions, Pakistan didn’t figure anywhere in the top 15 military spenders. The SIPRI report released on April 24, 2017 said global military expenditure was $1,686 billion, up by 0.4 per cent from 2015. The US maintained its position as the largest spender with an expenditure of $611 billion, an increase of 1.7 per cent from 2015. Second place China’s expenditure increased by 5.4 per cent to $215 billion. Russia has upped its military spending by 5.9 per cent to $69.2. Saudi Arabia lost its position to Russia and dropped to fourth position. It cut its military expenditure by around 30 per cent to bring the total spending at $63.7 billion. India upped its expenditure by 8.5 per cent to bring its spending to $55.9 billion. “World military expenditure rose for a second consecutive year to a total of $1686 billion in 2016—the first consecutive annual increase since 2011 when spending reached its peak of $1699 billion,” the report said. It said that expenditure increase in North America, Central and Eastern Europe, North Africa, Asia, Oceania. The drop was seen in places like the Middle East, South America, central America, the Caribbean etc. “The growth in US military expenditure in 2016 may signal the end of a trend of decreases in spending, which resulted from the economic crisis and the withdrawal of US troops from Afghanistan and Iraq. US spending in 2016 remained 20 per cent lower than its peak in 2010. ‘Despite continuing legal restraints on the overall US budget, increases in military spending were agreed upon by Congress,’ said Dr Aude Fleurant, Director of the SIPRI Arms and Military Expenditure (AMEX) programme. The report found that one of the major reasons for expenditure growth in the US was a large threat perception. “The growth in spending by many countries in Central Europe can be partly attributed to the perception of Russia posing a greater threat,’ said Siemon Wezeman, Senior Researcher with the SIPRI AMEX programme. “This is despite the fact that Russia’s spending in 2016 was only 27 per cent of the combined total of European NATO members,” he added. Oil exporters in the Middle East significantly cut their fundings, despite the fact that they are actively involved in the Middle East crisis and several conflicts and wars. The oil-price shock received due to falling oil prices and related economic woes has forced many oil exporters to cut their military spending, the report found. According to the report, between 2015 and 2016 Saudi Arabia had the biggest absolute decrease in spending of $25.8 billion.